Vegan desserts have come a long way in the past 15 years. When I first became a vegan, there were vegan cookies that tasted like cardboard and dry vegan cakes and the vegan ice cream was gritty with no creaminess. If you're going vegan now, you are so lucky. Most of the time, the reaction you'll have is, "I can't even tell this is vegan." I hate to hear someone say they would love to go vegan, but they just can't give up the chocolate. Guess what? You don't have to. You also don't have to give up cake, cookies, pastries, ice cream, or any other decadent treat you're worried about. What you might have to give up is the sheer convenience of being able to buy a dessert absolutely any time you feel like it. You will need to take more time to read labels and you might have to strategically plan where you go for your desserts, but I've always found the effort worth it. And, even better, if you like to bake, you have the world of desserts in your hands. When you get a sweet tooth, here are some great vegan desserts to get you started. Are you less a choco-holic and more of a vanilla fan? Me too! This recipe is adapted from The Joy of Vegan Baking, by Colleen Patrick-Goudreau. 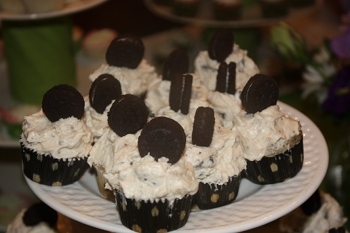 It is delicious and simple, and can be made into yummy little cupcakes. This vegan dessert recipe makes two 9" cakes. When I like to spice up vanilla cake, I'll add mix-ins like broken cookies, berries, nuts, chocolate chip, or even candy. Preheat the oven to 375°F. Lightly grease two 9" cake pans. Whip the egg replacer and 4 tbsp. water until smooth and creamy. Add the non-dairy milk and 1/2 cup water. In a large bowl, cream the butter and sugar until light and fluffy. Add the vanilla and the rest of the water and beat well to combine. In another bowl, combine the flour, baking powder, and salt, and then add the dry ingredients to the butter and sugar mix. Also, add the egg replacer. Then beat just until combined. Fill the pans and bake for 20-30 minutes, until a toothpick inserted in the middle comes out clean. Cool completely before icing. I often cut back on the milk in this buttercream frosting recipe to make it thicker and less likely to turn into vanilla soup. Start with less, and then adjust to the thickness you prefer. Cream the butter and sugar with an electric mixer. With the mixer on low, add the sugar, milk, and vanilla, and beat on high speed until it is light and fluffy. This will probably take about 3-4 minutes. Add 1-2 tablespoons more milk if the icing is too thick. Makes enough to frost a 1-tier cake. Maybe you love Mrs. Fields and her array of frozen pies that end up tasting pretty homemade, but until you've made your own homemade pie you a) won't know how easy it is and b) won't realize that the only thing that tastes like homemade is homemade. This is an absolutely delicious pie, and it's a must for anyone who has a collection of berries. Punch holes in your pie crust with a fork and pre-bake for 10 minutes. Remove the crust from the oven and let it cool. In a big bowl, combine the sugar, arrowroot powder, lemon juice, and lemon zest. When the mixture is creamy and combined, fold in the blueberries. Slip a cookie sheet under the pie pan and bake for 425 degrees for 30 minutes. Reduce the heat to 350 degrees and and cook for another 25-35 minutes. This vegan dessert recipe is from The Joy of Vegan Baking. Making pie crust is easier than it seems, but you just have to pay attention to the temperature of your ingredients. You also can't mix it too long or it becomes doughy rather than flaky. This makes enough for a lower and upper pie crust on one pie. Measure out all the ingredients and put them in the freezer for 30minutes before you start cooking. Use a food processor or hand mixer to combine the flour, sugar, and salt. Add the butter/shortening and pulse until the fat turns to pea-sized pieces. Drizzle in the ice water and pulse until there are no dry spots left. You should be able to press the dough into two balls by hand. If not, add a tiny bit more water. Press the dough into two flattened balls and cover with plastic wrap. Refrigerate the dough for 30 minutes to a few days. You can also freeze it for 6 months. When the dough is chilled, roll it out on a well-floured surface. Make sure not to warm the dough with your hands. Transfer the dough to your pie pan by delicately folding it in half and half again (so it looks like a quarter of the circle), and then unfold into the pie pan. We love smoothies as a vegan dessert. The great thing about them is once you know how to put one together, you can make them with pretty much any fruits and vegetables. Bananas help give some creaminess, sweetness, and texture to smoothies. Add all ingredients in a strong, ice-crushing blender like the Vitamix. Pulse to combine and let it run until you reach desired consistency.